Univision's Randy Falco, pictured in 2011. The merger of Comcast and Time Warner Cable could hurt media companies that compete with Comcast and could be "bad for Hispanic audiences," the chief executive of Univision, Randy Falco, said Monday. Falco stopped short of opposing the merger outright, but expressed sharp concerns about the potential combination of the two companies. 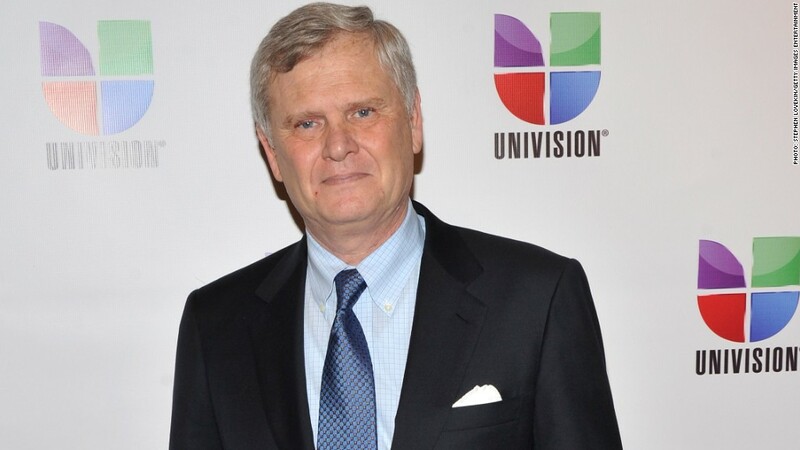 As government regulators undertake a review of the merger, he said he hopes that "the right questions are asked" and "that the right protections are put in place, particularly for Univision." Univision is the country's biggest Spanish language broadcaster. Comcast's NBCUniversal division owns the No. 2 Spanish language broadcaster, Telemundo. Comcast refuted Falco's comments on Monday evening, citing what it called a "great record of working with programmers from the largest to the smallest" and an "extraordinary, long-standing commitment to Hispanic programming." Comcast (CMCSA) and Time Warner Cable (TWC) announced their plan to merge in February. The two companies are awaiting government approval. Falco's comments — which seemed at least partially scripted, and came during an earnings conference call with investors — were striking because big companies whose channels compete with Comcast-owned channels have mostly kept their concerns about the merger to themselves. One exception has been Netflix (NFLX), which depends on broadband providers like Netflix for access to subscribers and negotiates with Comcast and other media companies for access to TV shows. Last week Netflix said it feared that the merger would give Comcast "anti-competitive leverage." Falco raised a similar complaint on Monday. "You've already heard that the new Comcast will be the dominant cable and high-speed broadband provider in markets with 30% of all U.S. cable households," Falco said on the call. "What you may not know is that the new Comcast will serve markets with 91% of all Hispanic households and be the top TV distributor in 19 out of the top 20 Hispanic markets. That gives this new company staggering influence over Hispanic consumers." He went on to describe how one of Univision's upstart cable channels, Univision Deportes Network, is being carried by "all of the top distributors" except Comcast. "Either Comcast doesn't understand that soccer is a passion point for Hispanics or they don't support competitors who have competing services," he said. "My fear is that the latter is the case and this type of anti-competitive conduct would continue." D'Arcy Rudnay, Comcast's chief communications officer, responded by saying that Comcast is "proud to be the nation's largest provider of Latino and multicultural television packages." She said Comcast carries "more than 60 Latino networks in both Spanish and English." The combined Comcast-Time Warner Cable "will not have undue power in negotiating with programming networks, and we have a great record of working with programmers from the largest to the smallest," Rudnay added. She said that "through the transaction with Time Warner Cable, we are committed to bringing high-quality Hispanic content to millions of additional Americans."